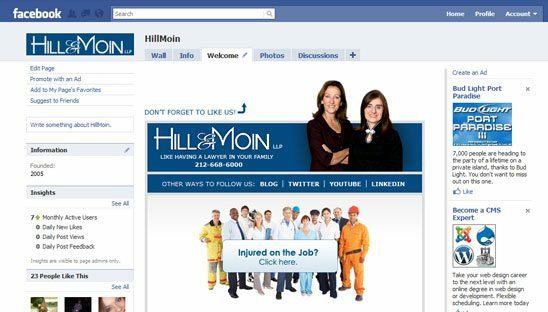 Hill & Moin LLP represents plaintiffs who have sustained serious and permanent injuries arising from: falls, work related injuries, automobile accidents and medical malpractice. With more than fifty years of combined experience, they have achieved extraordinary success. This Static FBML tab design includes a couple videos, Fb share button and much more. Check out the Verdicts & Settlements, Workplace Injuries and WHO WE ARE tab links inside, the body info changes when clicked on and we figured out how to give those rollovers.